Living with Lenno and living with The Pet Loo! The Pet Loo is the best invention for people with dogs in small spaces. After the pet playpen, it is an excellent investment! I was a bit skeptical of the Pet Loo initially - I'd read a bit about them but wasn't sure if Lenno would get it! After a bit of encouragement, he got the hang of it. Every time he jumps on to it I use the command "toilet" and I always give him a treat and heaps of praise and pats when he does the right thing! This will help reinforce toilet training for the months to come. Sorry for the in depth details but for those who want to know - the grass is fake and the urine drains down into a collection tray underneath. You just need to pick up the poo as you usually would when you take your dog for a walk. It is really clever - and better than having poo all over the backyard! I've also got some extra grass replacements so I can wash and dry those not in use. Lenno couldn't recommend The Pet Loo more highly! Here's a couple of photos of a cheeky Tawny Frogmouth I spotted recently. He looks a bit scary behind those beady eyes but they are harmless and rather comical creatures! 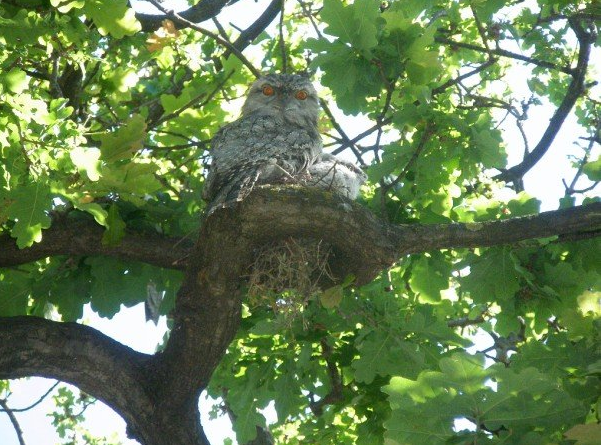 You may be surprised to know that many Tawny Frogmouths can be found in the inner city parks such as the Botanical Gardens. I saw an entire family there last year! Tawny Frogmouths breed from August to December so keep your eye out for grey fluffy babies peering at you from the branches above. Here is a photo I took a few years ago of a Tawny Frogmouth nest that was right outside my bedroom window in inner city Melbourne! If you look closely you will see the babies to the right of mum. What a week! Having Lenno in our lives has been nothing short of amazing. He has made us laugh non stop and has become my best little friend. I cannot believe how many people have stopped to talk to me when I have him with me! You are never lonely when you own a pet and a pet is definitely a great way to meet new people...and we haven't even been to puppy school yet. When it comes to the BEST puppy gadget so far, it has to be Lenno's playpen. I bought it from a big pet warehouse, for about $60. Buying it was the best decision I have made for him (and us!). You can see from the photo below that it is just like a baby's playpen. We have put him in the pen to sleep and when he needs some "quiet time". He feels safe in his little area and I can safely leave him here when I am cooking or doing jobs around the house. He is also happy to sit in his playpen at work. I've been rewarding him with a little treat and lots of praise when he is calmly resting here. It is amazing how quickly he caught on to the routine! Of course, Lenno has also been allowed a little bit of couch time too. I am happy to allow pets on the couch. There are some people who believe this can cause 'dominance issues" but animal behaviouralists are now moving away from this idea and understand that dogs want to be part of a family unit and simply like to be with you. Of course any signs of aggression or if your pet is not happy to be moved may be an indication it is best for time out off the couch. So far, Lenno is happy to just snuggle. He especially loves a woolly blanket! Stay tuned for photos of Lenno's first bath! I love Spring! There are new babies everywhere! These three fluffy cygnets are hanging out at the Albert Park Lake with their two doting parents. They are growing very quickly! Please be careful if you are taking your dog around the lake - sadly a few swans have recently been attacked by passing dogs. Did you know that Swans usually mate for life?? Hanging with Mum and Dad..
Lenno is a Cavalier Kings Charles Spaniel x Toy Poodle (although he looks much more like his mum who was the Cavalier!) My fiance and I had been waiting for the right time to take on the responsibility of a new puppy and thank goodness, finally the time had arrived! Let me know if you recognise this cat...I certainly do! I just had to share this with all the pet lovers out there! I had tears in my eyes. It is one of the cutest kittens I've ever seen! I was lucky enough to spend last weekend in the Yarra Valley with two very special dogs; Alaska and Bob. Alaska is a beautiful and very intelligent 10 month old German Shorthaired Pointer. She has the tough job of living at the Dominique Portet winery and she spends her days chasing rabbits and breathing in the fresh Yarra Valley air. It's a pretty good life. Although she does not drink, (alcohol is poisonous to dogs) she recommends their Sparkling Rose. Bob is a gorgeous little mix of a dog and he has a spunky personality to go with it. "Bob, get out of my bed and give me back my ball..."
And she loves snacking on grass - eating grass is normal dog behaviour! "Yuk, this grass is very bitter!" Bob is always up to something..."Please let me out, I want to go and chase those rabbits!" After way too much excitement, Alaska and Bob were exhausted! At least Alaska got her bed back!